At the last Smallville Comic-Con panel, the cast confirmed who would be Clark's antagonist this year, what new DC characters would cameo, and whether Clark would finally fly up, up, and away. Afterward, we interviewed the show's actors and writers. - Lois saying the word "Superman." - Blue Beetle and Booster Gold will guest star. Geoff Johns will be penning the episode. This could very well be that Blue Beetle footage that had been circulating a while back. - Members of the Suicide Squad will also appear. - Chloe will make an appearance in the comic books soon. - We catch a glimpse of what is probably Darkseid hooked up in a tank. He's pale, humanoid, and withered. - Lois is in a desert, and we see fleeting images of Hawkman. - Tess Mercer is alive, but half of her face is scarred. She wakes up in a lab filled with bodies in tanks (à la Darkseid). A creepy little kid points out to Tess that these are his "brothers." - Footage of Chloe holding Dr. Fate's helmet. - A final scene of Clark flying and lifting the Daily Planet globe, which is falling down to the streets below. At the round tables, Tom Welling was unfortunately mobbed. We did however get to speak with the show's other major players. We first sat down with Smallville writer and executive producer and show runner Brian Wayne Peterson. Peterson said that we would see the new outfit in the season premiere and again later in the season. He also mentioned that audiences haven't seen the last of Checkmate head honcho Amanda Waller ("There will be perhaps a bit of a twist on that character"). Peterson reiterated the fact that Michael Rosenbaum is welcome to return to the show and that "the door is always open." Last year we obviously got really dark and that was the whole idea was to put Clark through a lot of trials […] but this year […] the palette of the show will grow brighter and what he wears in episode two is going to change. The whole feel of the show will start gearing towards his future as a hero. I don't know if it's a vision. I don't know if it's an accumulated memory or if it's something Clark Kent needs to hear. Schneider promised that you'll see Pa working on the farm and that it's "the best scene [he's] ever done on Smallville." Pa says to Clark, "You could be the greatest hero the world has ever seen." Justin Hartley (a.k.a. Green Arrow) isn't writing any new episodes this season, but he'll be directing. He also hopes that Oliver Queen finds a modicum of peace this season, and that we won't learn Oliver's full fate right off bat. Executive producer and show runner Kelly Souders promised a slew of villains this season. 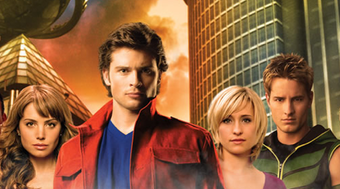 It's the last season of Smallville, so they're going to use as many villains as they can over 22 episodes. Clark's rogues gallery includes the recently confirmed Darkseid, Granny Goodness, and his other harbingers (albeit Smallvillized). Kelly also mentioned that Martha Kent will appear next season. Erica Durance expressed a strong desire to see her portrayal of Lois evolve into that of the iconic Lois Lane. She also promised more funny outfits ("Lois is going undercover") and noted that Lois gets to see Clark's physical power for the first time in the season premiere. He called me when I got the role [...] I had never met him. He was like, "Is this Tess Mercer?" And I was like, "Creepy! Who got my number?" And he was like, "This is Lex!" And I'm like, "Oh! Michael Rosenbaum." And he was like, "No, LEX!"